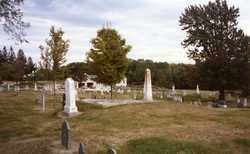 When you come down Gilman Rd (from Rte 88), you’ll see the Ledge Cemetery on the right. There is a helpful sign at the front of the cemetery with further information about this spot in Ancient North Yarmouth’s history. After the second house on the left (pale green), there is a dirt road called Garrison Lane. If you walk along the edge of the house’s yard, to the left of the lilac bushes next to Garrison Lane and go back about 100 feet, you’ll see the door step of the original Meeting House under the Ledge. Make sure to wander into the Pioneers’ Cemetery across the street. The house on the other side of Garrison Ln, (60 Gilman) was built in 1730 and was home to the first minister of the Meeting House.